A Brazilian man, Ricardo Azevedo from Sao Paulo, has displayed his miracle bike to the world. 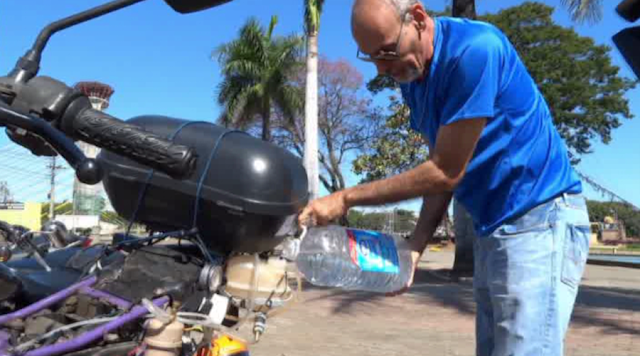 The magic machine can go up to 500 kilometers on a liter of water. The so-called “T Power H20” bike is powered by water and an external car battery to yield electricity and split the hydrogen from the water molecules. As a result, ignition is created giving the motorbike the energy to move. In the video below, Azevedo first drinks from the bottle, showing that it’s indeed water and not some kind of other fuel. Then he fills the container and rides off. Azevedo also shows how the bike actually works. The inventor demonstrates that even dirty waters from the Tiete River can be used to fuel the vehicle. The Brazilian is sponsoring his design as an environment-friendly machine. Azevedo told RT “The advantage of this motorcycle, which works with the hydrogen that comes from the water, is that the result that comes out of the exhaust is water vapor. This is different from gasoline, which [produces] carbon monoxide,"